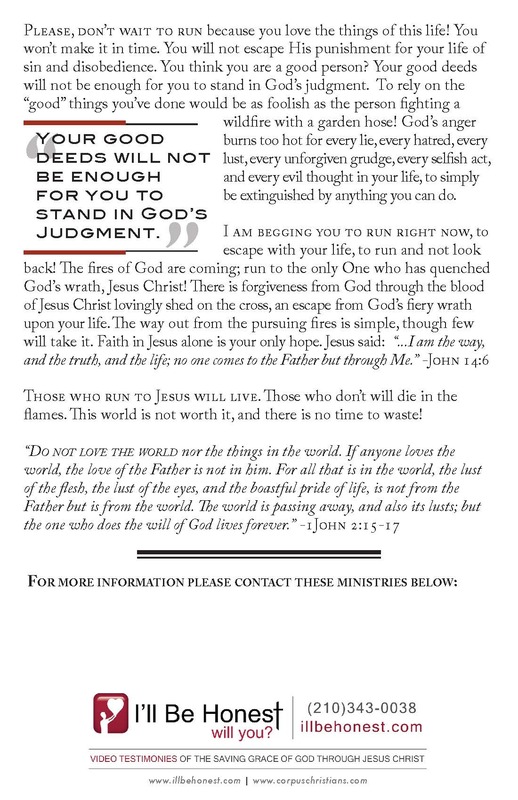 Free Gospel Tract – Would You Run? 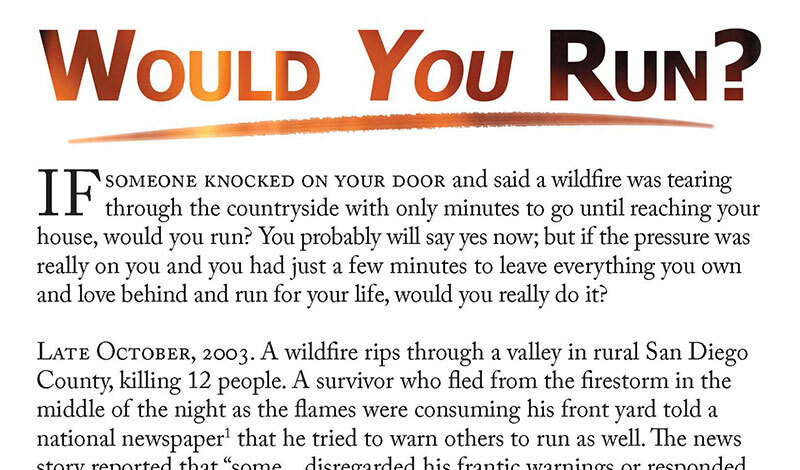 Tract Title: Would You Run? Full Text Of This Tract: Would You Run? If someone knocked on your door and said a wildfire was tearing through the countryside with only minutes to go until reaching your house, would you run? You probably will say yes now; but if the pressure was really on you and you had just a few minutes to leave everything you own and love behind and run for your life, would you really do it? Would you run? Maybe. 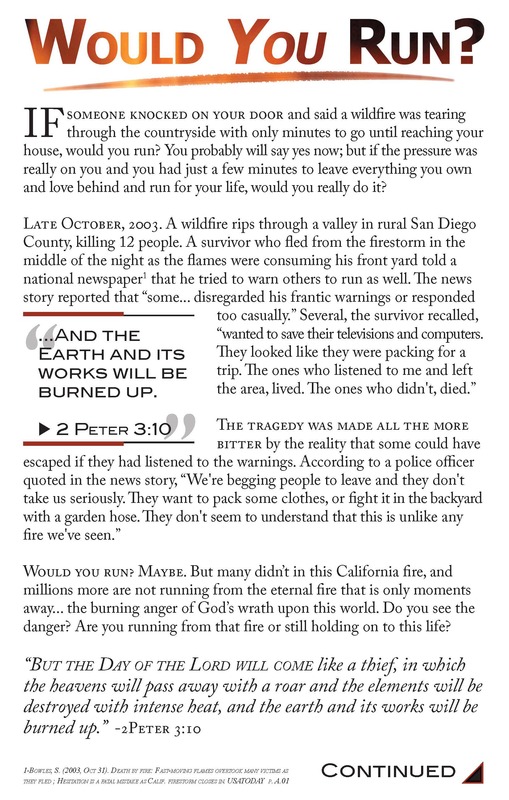 But many didn’t in this California fire, and millions more are not running from the eternal fire that is only moments away… the burning anger of God’s wrath upon this world. Do you see the danger? Are you running from that fire or still holding on to this life? Please, don’t wait to run because you love the things of this life! You won’t make it in time. You will not escape His punishment for your life of sin and disobedience. You think you are a good person? Your good deeds will not be enough for you to stand in God’s judgment. To rely on the “good” things you’ve done would be as foolish as the person fighting a wildfire with a garden hose! God’s anger burns too hot for every lie, every hatred, every lust, every unforgiven grudge, every selfish act, and every evil thought in your life, to simply be extinguished by anything you can do. Those who run to Jesus will live. Those who don’t will die in the flames. This world is not worth it, and there is no time to waste!